We’ve had two teams working on different projects for this year’s London Design Festival. This dynamic festival runs from 15th to 23rd September, hosting a range of innovative design projects across the capital and features work from an array of creative talent. We’re delighted to be involved! You can experience one of our projects at the V&A, the hub of this year’s festival. We’ve worked with Waugh Thistleton Architects to help create their MultiPly installation, an interactive modular maze-like structure in The Sackler Courtyard. 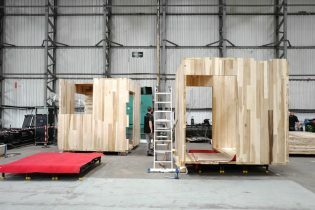 The pavilion confronts two of the world’s biggest challenges: housing and climate change, presenting the fusion of modular systems and sustainable construction materials as a possible solution. We’ve also been working with Es Devlin to deliver an interactive ‘5th Plinth’ installation in Trafalgar Square. ‘Please Feed the Lions’ will be installed overnight on Monday 17th September, when a fifth fluorescent red lion will appear alongside the famous Landseer lions. Unlike its stone-carved counterparts, this new lion will roar poetry. 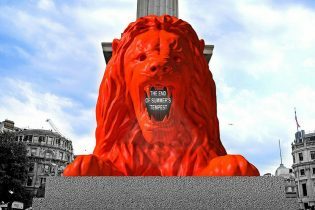 Everyone can “feed the lion”, the words appearing on LEDs in its mouth and at night, will be projected onto Nelson’s Column. Find out more about both projects on the London Design Festival website.